Following on from that first encounter, Jim got in touch to say he was in the market for another 'real' Doosan for his fleet. His namesake here at Ability Handling, Jim Quinn, recommended he visit our depot to try out some of the wide range of new and used trucks we had in stock to see which model would suit him best. After just five minutes test-driving, Jim was convinced that a recently refurbished D55S-5 was the machine for him and immediately placed an order. The refurbished machine was duly delivered a few weeks later and took pride of place in the Wallis Metals fleet. However, that certainly wasn't the end of the story; Jim was so impressed with his short experience of the D55S-5 that he was soon back at Ability Handling again. 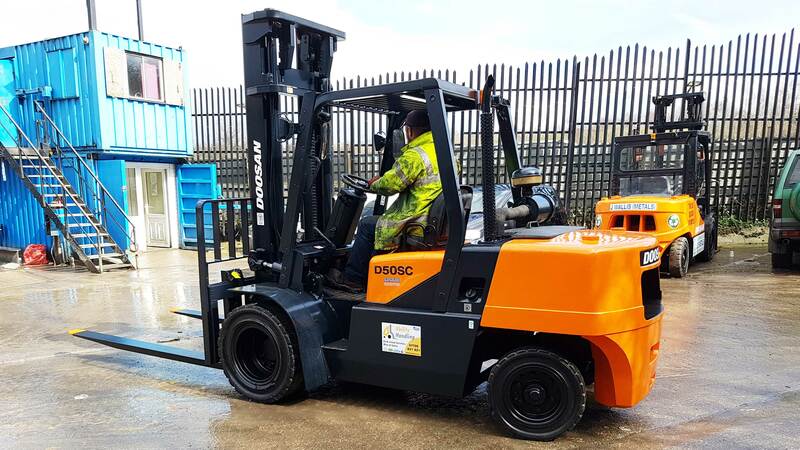 After examining several trucks, he opted to purchase a used Doosan D50SC, which featured twin drive wheels; ideal for a machine to be fitted with a hydraulic bucket used to transport loose fragments of metal into large skips where they can be safely stored before disposal. Then, just before Jim left, he noticed a familiar sight; the sister truck to the first D55C-5 he purchased on his first visit. On impulse he decided to buy this truck as well and so he is now the proud owner of a 'real' Doosan fleet. Jim said he is highly delighted with all his new trucks and especially the way Ability Handling conduct business. The Doosan brand of forklift trucks and materials handling equipment is synonymous with rugged design and unmatched versatility. We here at Ability Handling are proud to supply a full complement of both new and used Doosan equipment and our knowledgeable team are always on hand to offer the most competent, clear and relevant advice and support. To find out more about the Doosan range of forklift trucks, get in touch with us today.